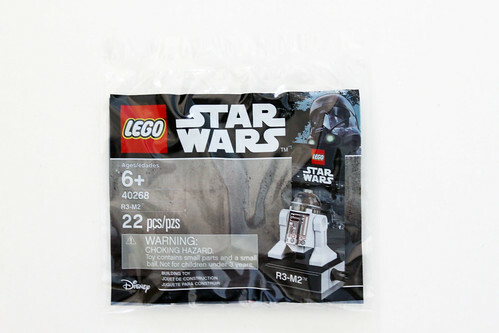 Way back in January, it was revealed that there was a new LEGO Star Wars polybag with R3-M2 (40268). It had a little stand with a backing that is different from your standard minifigure polybags. There was little to no detail on its availability except for it showing up at LEGOLAND California back in March and a recently showing up at Toys R Us. I was able to purchase it for $5.99 online before the page was taken down. It was also reported that they can be found in store but they do have a street date of August 26. You may get lucky and be able to purchase it but there’s a high chance that you won’t be able to purchase until then. 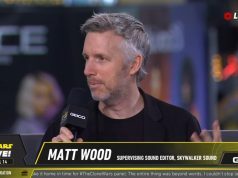 R3-M2 is a very obscure astromech droid that has only appeared shortly in Rogue One: A Star Wars Story. 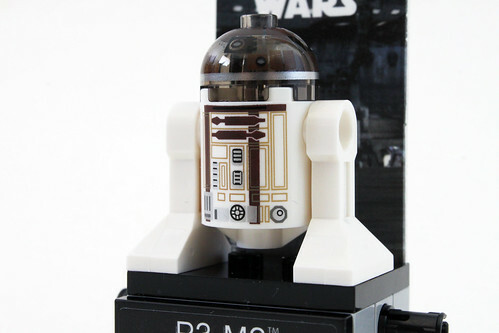 The body has your typical LEGO droid pattern with the main notable differences being the large bold stripes as well as the brown and tan coloring. 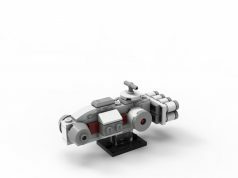 The back of the torso and both legs have no printing at all however according to the one in The Disney Collection 2016 Droid Factory 4-Pack , R3-M2 is supposed to have a brown stripe going down the back. The dome is trans-black with a silver ring at the base with some brown panels throughout. 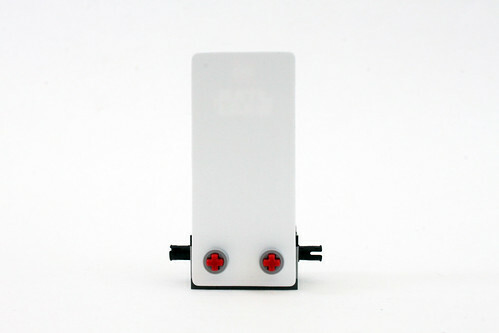 R3-M2 comes with a stand that also has a backing card. The stand itself uses the black 3×4 that sits on top of a small build that uses a 1×4 brick with studs on the side for the name plate. 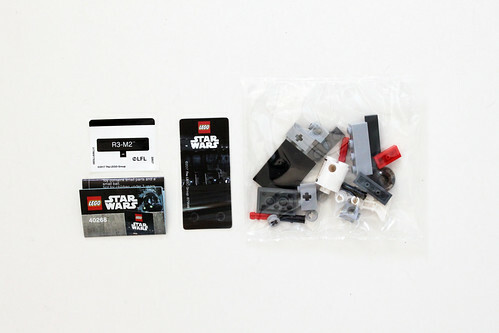 Unfortunately, it uses a sticker but they polybag would’ve cost a little more if it had a printed name plate. There are also some bricks with holes that utilizes some Technic pins. 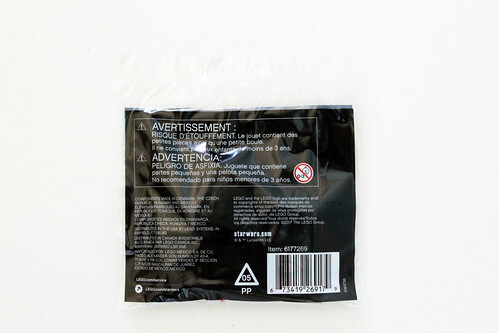 This is used to connect a series of these polybags together with the next one being the Scarif Stormtrooper (40176) which will be available in September. The background card is attached to the base using a couple of Technic axles. 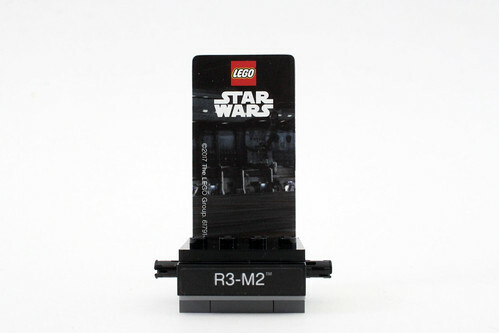 It has the LEGO Star Wars logo with the background showing a scene from the hanger on Yavin 4. There’s also the LEGO copyright which is sort of off-putting. Once R3-M2 is on the stand, you can only see a little part of it. 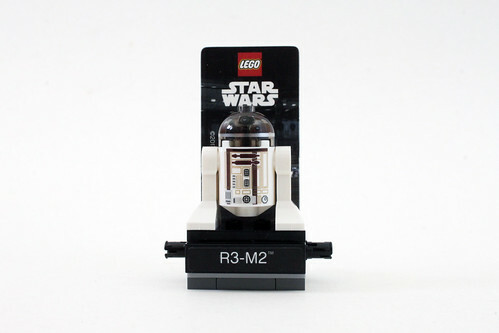 R3-M2 itself is an unique minifigure and is only obtained in this particular polybag. It’s availability is still somewhat sketchy but it was found at Toys R Us. 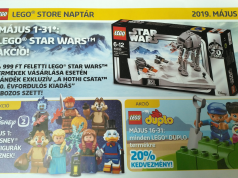 It may seem that it’ll be free with a certain purchase, most likely with a LEGO Star Wars purchase.